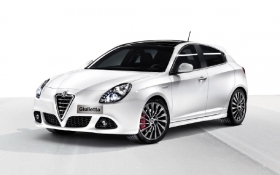 Fiat wants to revive Alfa with new cars such as the Giulietta. TURIN -- Fiat S.p.A. is refusing a new round of Volkswagen AG overtures to buy its troubled sporty Alfa Romeo brand, company sources told Automotive News Europe. VW is on an acquisition spree to help its bid to topple Toyota Motor Corp. as the world's No. 1 automaker. Asking not be named, two VW executives have confirmed to ANE that VW, Europe's largest automaker, is “seriously interested” in buying Alfa. Then today, after new rumors emerged about VW's interest in Alfa, a Fiat spokesman said the company is sticking to a turnaround plan for Alfa announced by Fiat CEO Sergio Marchionne in April. Marchionne said then that he wants to transform Alfa into a “full-line premium carmaker” selling 500,000 units in 2014, up from 102,000 last year, helped by six new model launches. In April, VW CEO Martin Winterkorn told reporters that he admires Alfa, but said the VW group, which is in the middle of taking over sports car maker Porsche, is not planning to add another brand. In recent years, VW has recruited former top Alfa executives Walter de' Silva as its design chief and Luca De Meo as marketing boss. It also owns Italian supercar maker Lamborghini and took a 90 percent stake in Italdesign Giugiaro earlier this year, but Winterkorn said: "Our appetite for buying in Italy is fully satisfied." Winterkorn's statement was clear, but there are a number of other Alfa fans in VW's Wolfsburg headquarters, such as VW Chairman Ferdinand Piech, as well as de' Silva, who was Alfa's design director before joining VW in 2000 and De Meo, who was CEO at Alfa before joining VW last summer. Analysts are skeptical about whether Alfa can reach Marchionne's ambitious target of 500,000 annual sales under Fiat. ”Maybe Alfa could get to a half million unit sales a year, but only after the brand is sold to Volkswagen,” Arndt Ellinghorst, global head of automotive research at Credit Suisse, told the Automotive News Europe Congress in Bilbao in June. Fiat does not report separate financial results for its brands, but sources say Alfa has lost between 200 million euros and 400 million euros a year over the past 10 years. Rumors of a possible sale of Alfa to VW surfaced first in Turin and Wolfsburg late last year. The buzz has not died down despite VW's and Fiat's repeated denials that a deal is in the works. VW would be interested in purchasing Alfa Romeo should it become available to buy, Automobilwoche, an ANE sister publication reported Monday, citing an unidentified high-ranking VW manager. Alfa Romeo could support VW's growth strategy, the manager said. "Alfa is a globally recognized brand with sporty genes and a great tradition," the paper quoted the VW manager as saying. "If such a treasure could be had, we must not hesitate ... too long." Volkswagen is often considered by analysts to be the most successful multibrand car company in the world, selling everything from VW Golf hatchbacks through luxury sedans from Audi to 16-ton Scania tractor trailers. Yet VW's biggest problem remains Seat, a Spanish brand that has failed to expand significantly outside of its domestic market, where it is also losing share. At one point, Seat, which sells three times more cars than Alfa Romeo, tried to position itself as a competitor to the Italian brand. Bernstein analyst Max Warburton wrote in December of last year that technological similarities to VW's own model range could offer financial savings while handing the German carmaker control over arguably one of the European industry's most powerful names with a long and rich history in racing. "VW might look at Alfa and see a brand that it could transform into something successful. The technological links and scale benefits are clear -- Alfas are all front wheel drive, transverse engined cars," he wrote, adding an Alfa MiTo or Giuletta could be built on a VW Polo and Golf platform. "It's pretty simple in our view -- VW could kill the Seat brand and re-launch it as Alfa. Former VW CEO Bernd Pischetsrieder used to say that he wanted to turn the (struggling) Seat brand into a 'Mediterranean, emotional, sporting brand -- VW's Alfa Romeo'," Warburton wrote. "Rather than imitate, why not just actually become Alfa Romeo?" VW spokesman Michael Brendel said told Bloomberg News that the company doesn't comment on market rumors.